Having better specs than a competing product does not guarantee pricing power. After continual improvements, market satiation along one or more dimensions may be achieved. Christensen introduces a couple of simple models to understand this phenomenon. When a product's functionality surpasses that which the market demands, for example, customers may then select on the basis of reliability. Once reliability needs are met, the focus may shift to convenience. Once these three aspects are met to a satisfactory degree, a product may become a commodity, whereupon customer selection is based on price. 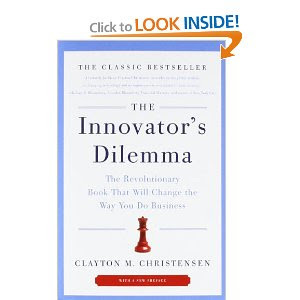 One common feature of disruptive products is that they are often more reliable, convenient and cheaper than existing products, according to Christensen. This means that once technology improves to the point where functionality catches up to market requirements, disruptive technologies will win out on the other dimensions sought by customers. Note that the functionality of disruptive products does not have to catch up with the functionality of the incumbent product; it just has to catch up to the point where the market is satiated. The successful companies have been those which have found new markets for disruptive technologies until such time as the technology catches up. The unsuccessful companies are those that tried to improve the functionality of disruptive products so that existing customers would use them; the long lead times required here lead such companies to eventually give up while entrants become leaders in the disruptive products.